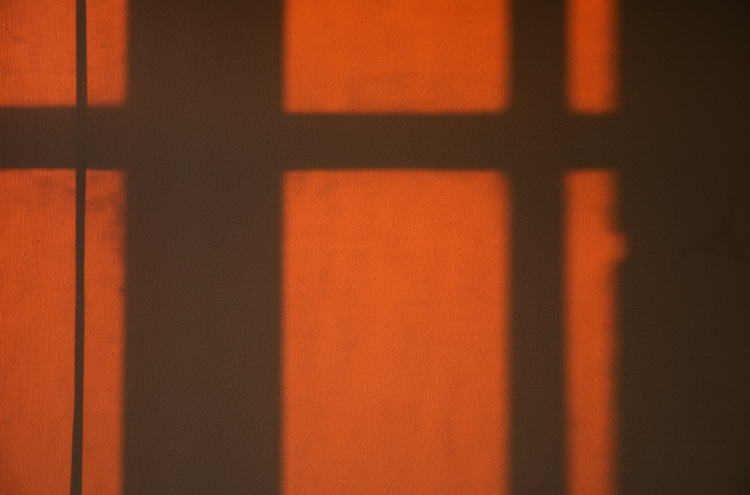 The shadows of a window frame cast on the office wall, very late this afternoon. Details: Nikon 18-70mm, 65mm, f/4.5, 1/60s, ISO 200. I have to say after admiring your work, you sure know how to capture a beautiful image...amazing! Just wondering, you have awesome clarity & colours in all your photos. Do you do any retouching or colour correction on these images? Thanks for your kind comments, most appreciated (as are everybody's, 'although ask a specific question, get a specific answer'). 0) Sharpen. I sharpen every image (differing amounts) to undo the effects of my publishing process. I upload a full resolution version to my server, then let the code on my server resize back to the current size my page design presents the images at. A while ago I realized that the resizing process was losing some of the sharpness, so I now pre-sharpen to negate that effect. 1) Colour correction. I shoot RAW, so in a way I have to make some kind of decision with each shot I process, but usually I stick with the 'as shot' colour temperature. After that I usually make some kind of curves adjustment to enhance contrast. Unless I'm clearly going for some kind of 'effect', really all I'm trying to do is match how I originally saw the scene in my head. 2) Vignetting, selective sharpening. Sometimes, to direct attention, I'll add some kind of vignetting to a curves adjustment in order to make one part of the image 'punchier' than the rest. Also I might over-sharpen one specific bit of an image, for similar effect (not very often, but the beetle shot a few days ago fits in that category). 3) Retouching. Rarely, although once in a while I'll clip out a tiny fragment of something. I can only think of one right now -- getting rid of a couple of leaves out of a sky scene. I'd rather crop than retouch, but occasionally the composition won't work for me, after I crop.